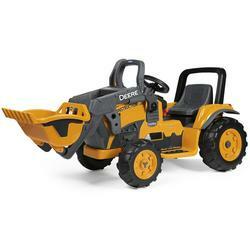 The John Deere Construction Loader with a working front loader brings a child’s imagination to life. Little riders will enjoy scooping up their load, driving to their destination and dumping it from the driver’s seat. The adjustable seat is perfect for growing children. The 2-speed shifter with reverse allows drivers to ride at 2 1/4 and 4 1/2 mph on grass, dirt or hard surfaces. Automatic brakes and extra traction wheels make driving easy, comfortable and safe. 12-volt rechargeable battery and recharger included. Made in the USA, in our Fort Wayne, Indiana factory using domestic and global components. Loader Working front loader, scoops, lifts, carries and dumps from the drivers seat. Made in the USA Made in Fort Wayne, Indiana using domestic and global components.